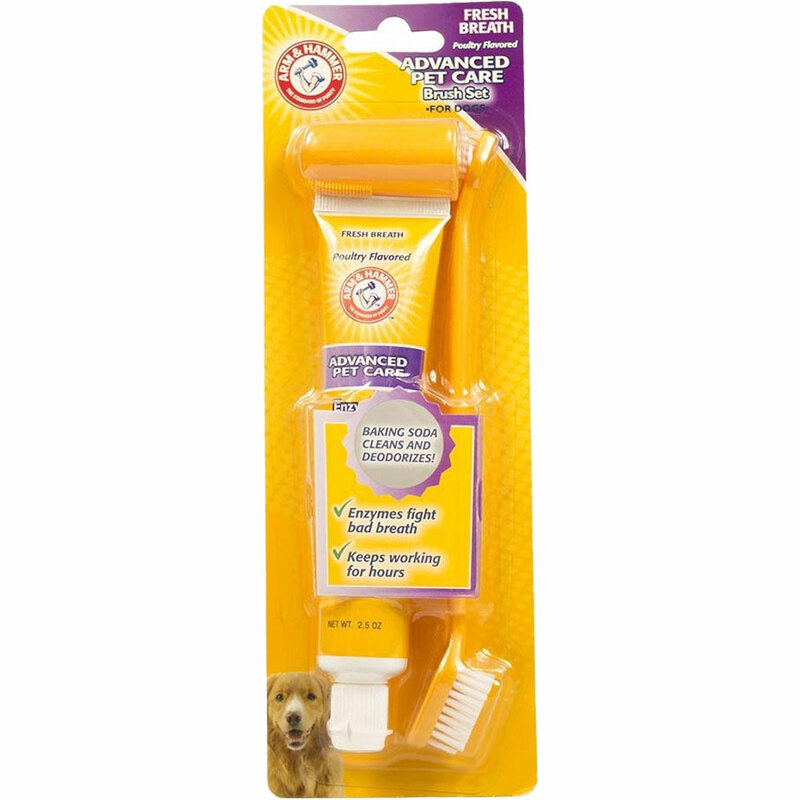 Arm & Hammer Dental Toothbrush Set for Dogs includes a dual headed toothbrush, a finger brush, and Advanced Care toothpaste. 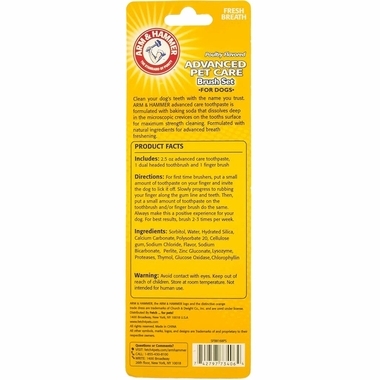 The toothpaste was created with unique enzyme technology enhanced with baking soda to fight tartar buildup and give your pup a deep clean. 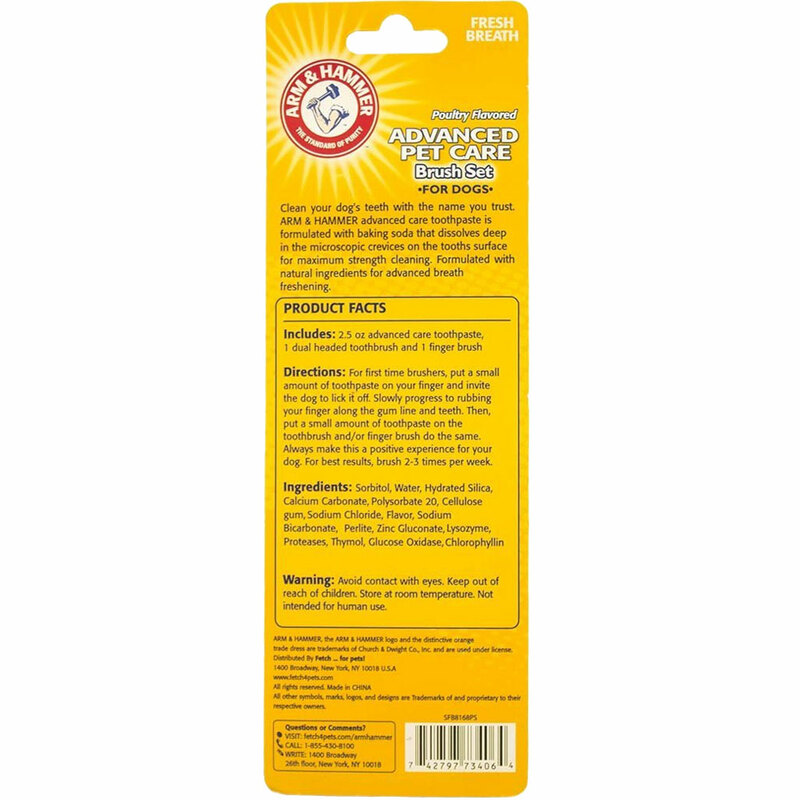 A dual headed toothbrush allows you to adjust to your dog's mouth and clean even the hard to reach areas. Maintain your pet's dental health with this effective combination that leaves breath smelling minty fresh. A palatable flavor makes brushing teeth enjoyable each time! Sorbitol, Water, Hydrated Silica, Calcium Carbonate, Polysorbate 20, Cellulose Gum, Sodium Chloride, Flavor, Sodium Bicarbonate, Perlite, Zinc Gluconate, Proteases, Thymol, Glucose Oxidase, Chlorophyllin. 2.5 oz Advanced Care toothpaste, 1 dual headed toothbrush and 1 finger brush. For first time brushers, put a small amount of toothpaste on your finger and invite the dog to lick it off (toothpaste not included). Slowly progress to rubbing your finger along the gum line and teeth, then put a small amount of toothpaste on the toothbrush and do the same. Always make this a positive experience for your dog. For best results, brush 2 – 3 times per week.